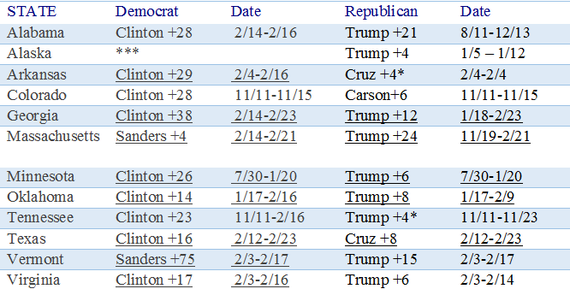 The Republican and Democratic presidential nominating campaigns are moving toward the SEC primary on March 1. In the last six weeks, we've learned much about the strengths and weaknesses of the candidates. We have learned even more about the flawed processes we use to determine party nominees. If nothing changes by March 2 (the day after Super Tuesday), Donald Trump and Hillary Clinton will be the presumptive Republican and Democratic nominees. The key phrase is "if nothing changes" because while campaigns are not built overnight, campaign narratives can quickly shift in light of emerging issues and events. Neither Donald Trump nor Hillary Clinton are assured victory, but they are now in a position where the finish line is in sight. When all is said done, it's our suggestion, sitting out here in the Oil Patch, that the Republican and Democratic parties respectively should meet to discuss new rules for securing the nomination. These new mechanisms should assure an even larger voice for party regulars and a smaller voice for an inattentive and easily swayed public. (We'll have a future post on the state of the parties and the need for general party reform). So What's the Problem? It is our belief that that the current nominating system is a dyadic structure (almost triadic for the Republicans), and this system creates unhealthy distortions of the nominating process. The early presidential contests are exercises in retail politics. Candidates can meet personally with voters, and the ability to persuade a relatively small number of voters to secure only a few delegates has a tremendous impact in establishing frontrunners and setting momentum in the horse-race. The Republican Nomination: Many of us (present authors included) discounted Donald Trump's ability to win the Republican nomination. His early success was built almost entirely on "earned media" and his ability to distinguish himself from a crowded Republican field. The differences between Marco Rubio, Ted Cruz, and Jeb Bush are fairly trivial compared to the stylistic and issue differences between Trump and everyone else. Donald Trump's continuing (and growing) success reflects a critical but flawed strategy on the behalf of the "mainstream" Republican candidates. Trump, they reasonably assumed, would eventually falter. So, they decided to basically take a "rope-a-dope" approach to dealing with him, lay back, indulge his hyperbole, and wait for him to punch himself out on insults and gaffes [boxing analogy #1] until he had his Dean Scream moment [object lesson #1]. The trick for the 'serious' candidates was to emerge as the reasonable alternative. The Republican field differed in their approach. Ted Cruz attempted to play nice for much of the campaign, hoping that disaffected and angry Trump supporters would eventually find their way to his campaign. When Cruz won in Iowa, Trump quickly turned his attention to dismantling Cruz's appeal, including calling him out for lying and dirty campaign tricks and literally questioning his parentage as an American citizen. Cruz and Rubio Gain on Bush in S. Carolina"
Meanwhile, the 'goodhair candidates' (apologies to Molly Ivins) -- Marco Rubio, Jeb Bush, and John Kasich -- appealed to the Republican establishment, assuming the eventual nominee would emerge Romney-like (or McCain-like) from the ideological middle of the Republican Party. More than the others, Bush was drawn into battle by Trump's repeated and belittling attacks that Bush lacked energy or was "pathetic." But throughout, Jeb was responding to--rather than initiating--the battle. The history of Republican nominating contests suggested appeasing the conservative base while winning over the establishment was a reasonable and generally effective approach, but history is always a helpful guide until it isn't. And, in this case, Bush was caught in the "if you are explaining, you ain't winning" trap and crashed in an effort worthy of John Connolly [object lesson #2]. The longer Donald Trump has remained in the spotlight and leading in the polls, the more legitimate and less crazy he seems as a possible nominee. He is now winning across a wide swath of fractured and fragmented Republican constituencies, raising the ceiling on his potential support, and moving impressively--if not methodically--to toward the Republican nomination. If the Republican Party wants someone other than Trump, Messers. Rubio, Cruz, and Kasich can no longer afford to shoot at each other, circular-firing-squad style. Instead, they need to aim their slings and arrows directly and unsparingly at Trump - indeed, one of them might need to go on the Kamikaze mission that destroys both the pilot and the target [war metaphor #1]. Even this may be too little, too late as Trump has proven to be a remarkably effective counter-puncher and deflector. Think of a political Floyd Mayweather who frustrates his opponents by avoiding their punches while constantly jabbing and keeping them at a distance [boxing analogy number 2]. *Underlines indicate numbers are based on averages. Entries not underlined are based on most recent poll result. The Democratic Nomination: Seasoned political candidates often go into battle planning to fight the last campaign. This is why they get caught off-guard by the unexpected. For Hillary Clinton, losing the last campaign might be her saving grace. As in 2008, electoral politics has demonstrated her vulnerability to even the most unlikely challenger. Unlike 2008, she has a firewall of support with African-American and Hispanic voters that will serve her well in the SEC primary. She also benefits from the fact that Bernie Sanders, whatever his appeal, is no Barack Obama. She should do very well on March 1, cementing her status as the likely Democratic nominee. Bernie Sanders may not drop out any time soon but by March 2 his campaign may be mostly about shaping the 2016 Democratic campaign and not winning the nomination. Like the Republican field, Sanders finds himself in a curious position. He has built a campaign around a simple repetitive message. The game is rigged, politics is corrupt, and we need political and financial reform. 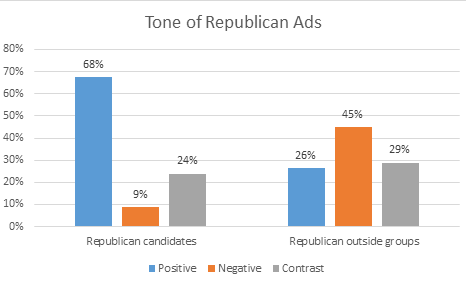 This has also meant not going on the offensive with negative political campaign ads. Indeed, it is surprising that just how positive the Democratic race has been to this point, particularly given that it has been closely contested. Sanders' most critical message to date--classified as a contrast ad rather than a negative ad--avoids mentioning Hillary Clinton by name and instead offers only the insinuation that Clinton is part of a rigged system. 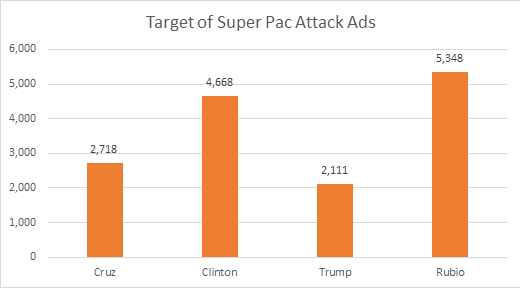 Sanders has been assisted by Republicans, especially Marco Rubio, who have made Hillary Clinton a frequent target. To change the direction of the campaign, however, Sanders will most likely need to go on the attack, raising questions about Clinton's trustworthiness, and implicating her in ongoing scandals. Doing so, however, takes the shine of his claim to be different and of being a candidate of ideas rather than tactics. South Carolina Democrats: This is an early Saturday game and one that will tell us not only about the Palmetto State, but also Georgia, Alabama, Arkansas, and Virginia on Tuesday. If Hillary gets 75% of the black vote and loses among whites, she still gets two-thirds of the delegates. Wildcatters' Loser: Bernie Sanders. Alabama Democrats: See South Carolina. Hillary's gonna look like Bo Jackson. Wildcatters' Loser: Bernie Sanders. Arkansas Democrats: The Lady MacBeth of Little Rock will finally find some love in Arkansas. Wildcatters' Loser: Bernie Sanders. Arkansas Republicans: Here's a contest that can go three ways now that Asa Hutchison has weighed in. If Rubio rises and Cruz doesn't crash, it could be bad night in The Natural State for The Donald. Wildcatters' Loser, in a close one: Donald Trump. Georgia Democrats: See South Carolina. Hillary's gonna look like Herschel Walker. Wildcatters' Loser: Bernie Sanders. Massachusetts Democrats: Hillary wins, but closer than you think. Wildcatters' Loser: Bernie Sanders because he needs to be Bobby Kennedy after Obama's JFK. Massachusetts Republicans: They like their billionaires. Wildcatters' Loser: Marco Rubio. Minnesota Democrats: Ignorance is bliss. Wildcatters' Loser: Hillary Clinton. Minnesota Republicans: We know nothing, so we're saying Trump because of Jesse Ventura. Wildcatters' Loser: Marco Rubio. Oklahoma Democrats: There used to be Socialists in Oklahoma. They'll feel the Bern in the cities, but Hillary wins the battleground. Wildcatters' Loser: Bernie Sanders. Oklahoma Republicans: Marco Rubio needs a win. Ted Cruz needs a win too. Trump has a ceiling here, but it might be enough. Wildcatters' Loser: Ted Cruz. Tennessee Democrats: See South Carolina. Wildcatters' Loser: Bernie Sanders. Tennessee Republicans: Tennessee is a black hole, so we're saying Wildcatters' Loser: Ted Cruz. Texas Democrats: See South Carolina. Wildcatters' Loser: Bernie Sanders. Texas Republicans: Ted Cruz ought to win at home. 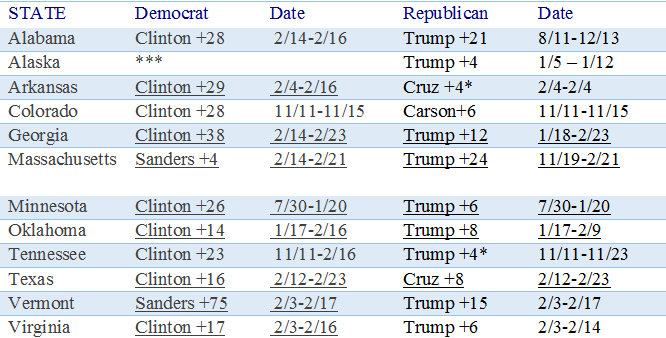 Trump and Rubio jostle for second. But Cruz ought to be blowing the roof off at home. It's Texas, for God's Sake! Wildcatters' Morale Loser: Ted Cruz. Vermont Democrats: Bernie Sanders and the Green Party Mountain Boys are laying in wait up in the People's Republic, and the spread is outside the home field +7. Wildcatter's Loser: Hillary Clinton. Virginia Democrats: See South Carolina. Again. Wildcatters' Loser: Bernie Sanders. Virginia Republicans: The most evangelical candidate running kicked off his campaign in Lynchburg at Liberty U., but he's learning that most evangelicals were only "raised that way"; they don't live and vote according to the Book of Falwell. Wildcatters' Loser: Ted Cruz. Alaska Republicans (Caucus): Friends don't let friends forecast caucuses. Colorado Democrats (caucus): Friends don't let friends forecast caucuses. Colorado Republicans (caucus): Friends don't let friends forecast caucuses.